As promised, I’m back yet again today with my second pair of Thurlow Trousers. I love the 40’s era trousers that I’ve been seeing online everywhere using the Simplicity 3688 pattern. I first spotted them on Debi’s blog My Happy Sewing Place (Fashions from the Past), then everywhere else (Lladybird‘s, Mena’s, Karen’s, Jane’s, plus more). I thought if all these gals could make them so could I.
Well…. I made them in muslin and they’re really, really bad. If I were to make them, they need some major adjusting. This is what led me to hijack the Thurlow Trouser to make my own 1940’s-inspired pair. Can you guys still tell they’re Thurlows? I’ve paired my trousers with my tallest red platform shoes to get my legs to be as long as possible, along with a vintage, cropped sailor knit top and a navy & white striped headband. Surprisingly, I didn’t make too many alterations to make them look like they do. First and foremost, I raised the waistline by a fatty 2 inches. (This was quite tricky to do and I had to alter the pocket and pocket facing pieces to do this). And I also decided to re-do the waistband entirely by using my BurdaStyle’s High-Waisted Trouser Waistband piece, which has more of a contour and is on the straight grain. I straightened out the side seams to fall straight down from the hips. I wanted to ensure you could still tell I had legs in these wide-legged pants, which is important due to my height. This is why I left the inseam the same so they curve inwards towards my legs throughout the thigh and knee area. Below are two shots of the pants lying flat. I used my red linen-blend, left-overs from my nautical 1/2 circle skirt for the facing pieces and the pocket. Otherwise nothing else fancy was done, just serged the seams and trimmed/graded when necessary. As I mentioned before, I had some issues setting in the center back invisible zipper. My denim is very light-weight, so I made sure to add in some interfacing to the zipper area so it wouldn’t be strained or wonky. But that is exactly what happened!! I put in the zipper 3 times and the last time was the best. It was still a bit bubbly, but I was happy with it. Yet something happened during transportation while it was on a hanger. (???) It created a horrible bump right at the base of the zipper. The zipper bump is creating a mega V towards the bottom of my rear. But the issue I need help with is the area just south of my booty. I don’t think these drag/smile lines are as bad as my charcoal grey pair, but they’re still there nonetheless. What do you guys think I need to do, to get rid of them for the next go-around? I’m pretty happy with how the front and sides look. They feel much sleeker with the higher waist since they skim right over my mega hips and small, lower tum. I think the original charcoal pair were more comfortable, but the fit is more in line with my personal style and they do feel a bit more slimming. 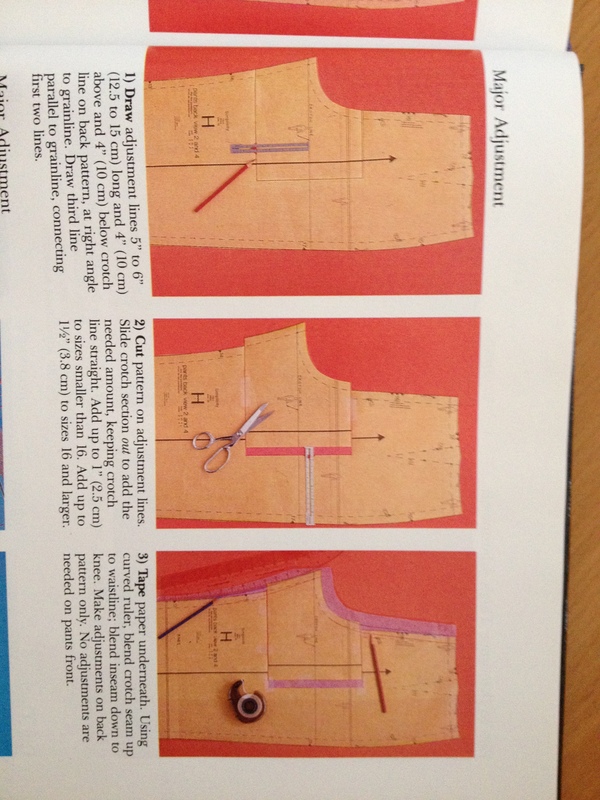 i have yet to try and make a pair of trousers – i’m scared, but i think i might go for the thurlow pattern! clovers look seriously tough! i looks a little bit like the back is being pulled round towards the front on the inseam. could you try widening the front pattern piece slightly to see if that helps? but i love the other alterations you have made – the waistline change is really flattering on you! Thanks so much for helping me out with the fit!. I’m going to try some of these suggestions on my next pair (or on my old muslin). Hm, it almost looks like you need to fiddle with that back crotch curve, like there’s not enough fabric in the back so it’s pulling from the front? I’m not entirely sure, the only pants-fitting I’m decent at is on my own body haha! Okay! So… I too had an issue with the front crotch length. I shorted my first pair since I was getting a slight sag at the front. And on this second pair, I kept the tuck I made to shorten them in the zipper area and added to the top waist and all was good. Oh very nice! I have just completed my first pair of thurlow shorts – an awesome base pattern! I do like the higher waist height though. I would recommend “pants for real people” for fitting advice. To me it looks like your back crotch is either a little short or not deep enough. Also I think you need to take a little width out of your back thigh? I think I’m having a crotch issue the more I look at them. While I know I have *full* thighs, they didn’t seem to pull that much in that department so I’m not certain. I love this style! Re: the fitting issues, my best guess is to lengthen the back crotch curve. But really I’m just guessing, and mostly I just do a whole lot of trial and error in my pants muslins to figure out what I need. Thanks Mika! I agree, I think my back crotch curve may be the issue. These look fantastic with the higher waist!! Really cute Liz. I think I’d put the zipper on the side though–keep the back a zipper free zone–but that’s just me. Sorry I have nothing to offer on fitting issues–good luck!! My favorite pants fitting resource is the book “Pants for Real People” by Marta Alto and Pati Palmer. There is a new edition out (2012) and you can get it at most bookstores and libraries. It’s a great fitting resource and it has fitting instructions for all kinds of bodies and it has pictures. Hope that helps! I just can’t tell if I have smile lines or frown lines… but once I do I’ll be able to follow along with the book. Their b&w drawings make it a bit difficult to decipher which issue I have is all. I’m strongly leaning toward saying they’re smile lines. It looks like there are drag lines pointing to the 1) crotch area and to 2) the knees. That may make it difficult to accuartely diagnose the fit issues in the crotch. 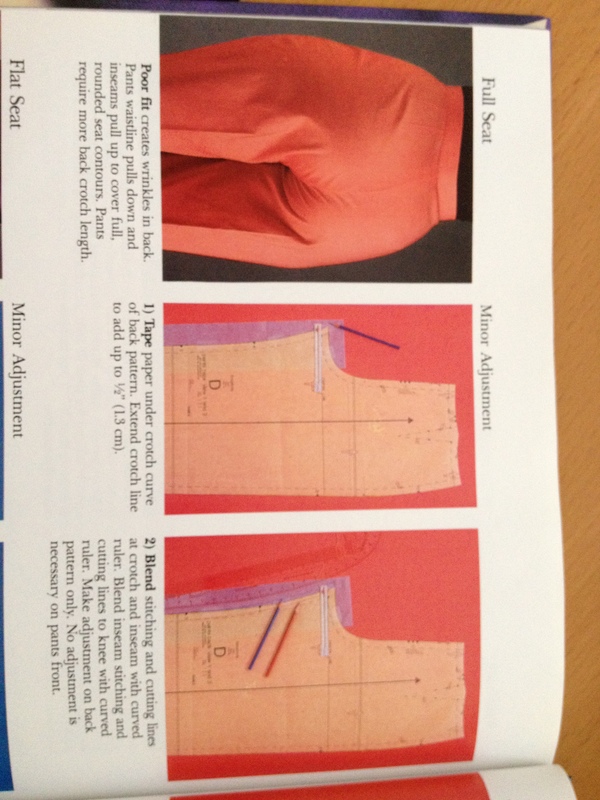 I’d suggest scooping the crotch seam aka sewing a deeper crotch seam for the back only. That should give you a little more length to the crotch curve. After that you may need to let out the inner seam on the back piece if its too tight. As for the drag lines pointing to the knees, the inner seam of (only) the back pattern piece may be curving in too much. I’d think if you straighten that inner seam slightly, those drag lines will disappear. Hey Karin. Thanks for the props on these ones. Being short, creating a higher waist on these trousers (I think) lengthens my legs, even though it shortens my torso. I just hopped over to your blog and your cropped pants have the exact same fit issue as mine! I’ll let you know if I learn how to fix mine if you do yours?! As for the lines, looking again, I am also going for the back crotch lengthening. It appears as if there is just not quite enough room in the back of the trousers… and that is causing some drag. Looking at the way the lines are pointing, it seems like the difficulty is definitely on the inner seam… so lengthening the back crotch would be the first place to start! Looking good! I am no help on the fitting problems, having not yet progressed to pants, but version 2 looks really flattering on you–teeny waist and long legs! Once again, an inspiration, and I like the side zipper idea. May try that when I conquer FOP (fear of pants)! You have made some pretty awesome trousers! I liked the grey ones, but I think i like these better. The high waist looks great on you. Thanks IngeMaakt. :) I think I prefer the higher waist on my figure vs. the low grey ones, too. I love the high-waisted ones! Based on my pants-fitting experience (limited in the extreme) and my perusal of Pants for Real People, I’d say those are definitely smile lines, and you need more room in both the back and front inseam near the crotch. You can taper it out for the leg to maintain the shape, though. Thanks so much Carrie! What do you mean by “taper it out for the leg….”? Sorry that wasn’t clear! Meaning, add width to the inseams (front and back) near the crotch, but then you can taper out that line to the original width farther down the leg, to maintain the leg silhouette—so if you add, say, 1/2″, it doesn’t have to be to the entire inseam, just the upper part. Does that make sense? I adore your high waisted Thurlows – they turned out fantastic! I’m sorry I can’t be more help with the fit – I tend to smush my bottom into pants and they usually end up being too tight that way, but the wrinkles get all stretched out :) haha! I love the whole ensemble you are rocking here – I feel like you need to be out on the lake on the Tall Ship Windy stat. I’m currently going through a fitting book because I’m wanting to address some issues with my own trousers, and it looks like you need a full seat adjustment. The wrinkles look exactly like the ones in the book! Something you could try with these pants is to stitch the crotch length 1/4″ deeper. It might not be enough, but if the wrinkles ease up then your finished pants will look a bit nicer from the back. You’re the best Kris!!!! You’re 100% correct, this is exactly what my trousers are looking like! Yay! What fitting book is this so I can go out and buy it for my very own?! It’s a delightfully cheezy one, in that it’s from the ’80s. Singer: The Perfect Fit. You can get it for super cheap, too! It doesn’t have everything, but I find it’s pretty useful. Thanks sooo much! I just purchased the book via amazon since I get free shipping there. It’s due to come in tomorrow even. yay!